In a split decision, the California Supreme Court on Monday declined to review an appellate court ruling that overturned Vergara v. California, a landmark case that challenged teacher tenure and declared some school employment laws unconstitutional. The court was split four to three, with two of the dissenting judges issuing lengthy and forceful statements that laid out why action is needed on the state’s tenure laws. “These are two scholars, legal scholars, brilliant scholars, who have explained why these issues are so important, why the statutes are so bad, why the court should have taken this case,” he said. Boutrous said the justices’ opinions will be a “launch pad” to a possible federal case. “We have been exploring possible federal challenges based on very similar theories and other theories” as related to the Vergara lawsuit, he said. Justices Goodwin Liu and Mariano-Florentino Cuellar, who wrote the dissents, were nominated by Gov. Jerry Brown and reportedly on President Barack Obama’s short-list as possible U.S. Supreme Court nominees this year after the death of Justice Antonin Scalia. “As the state’s highest court, we owe the plaintiffs in this case, as well as schoolchildren throughout California, our transparent and reasoned judgment on whether the challenged statutes deprive a significant subset of students of their fundamental right to education and violate the constitutional guarantee of equal protection of the laws. I respectfully dissent from the denial of review,” wrote Justice Liu. Justice Cuellar wrote in his dissenting statement: “Beatriz Vergara and her fellow plaintiffs raise profound questions with implications for millions of students across California. They deserve an answer from this court. Difficult as it is to embrace the logic of the appellate court on this issue, it is even more difficult to allow that court’s decision to stay on the books without review in a case of enormous statewide importance. “Nothing in California’s Constitution or any other law supports the Court of Appeal’s reasoning. “There is a difference between the usual blemishes in governance left as institutions implement statutes or engage in routine trade-offs and those staggering failures that threaten to turn the right to education for California schoolchildren into an empty promise. Knowing the difference is as fundamental as education itself. Which is why I would grant review,” Cuellar concluded. The decision puts an end to the Vergara lawsuit, which had challenged five statutes: tenure, dismissal laws and “last-in-first-out” laws that determine layoffs based on seniority. The suit did not challenge federal laws or the U.S. Constitution, so the case cannot be appealed to the U.S. Supreme Court. “Transforming our public education system from a system that exacerbates inequality to a system that creates opportunity takes all hands on deck,” Welch said. He said the nonprofit organization would turn its attention to the state Legislature, as well as to legislatures around the nation, to change laws to “ensure all students have access to the quality teachers they deserve.” He said Vergara changed the conversation. “We hope the state Legislature is listening, recognizing the compelling need to act,” he said. 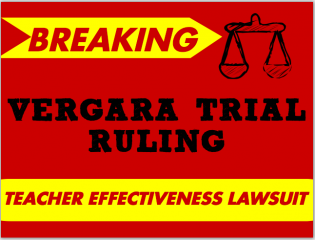 In an April 14 decision, a three-judge appellate panel said it found the plaintiffs in Vergara v. California didn’t present enough evidence to show that minority students were more often subjected to ineffective teachers than other students. It unanimously reversed the lower court ruling. California’s teachers unions, who had characterized that ruling as a “win,” also claimed victory with Monday’s action, with the California Teachers Association and the California Federation of Teachers releasing a joint statement following the Supreme Court decision. In a statement, American Federation of Teachers President Randi Weingarten said she was “relieved” by the Supreme Court’s decision. California has among the nation’s highest protections for teachers. It is one of only 10 states that use seniority as the sole factor in determining how to lay off teachers. Evidence presented at the trial showed that it takes anywhere from two to 10 years to fire a teacher and it costs from $50,000 to $450,000. State lawmakers have been unsuccessful in attempting to make changes to teacher tenure laws at the legislative level. The California Teachers Association is one of the most powerful lobbying groups in Sacramento. Most recently, a bill that would have extended the probationary period for new teachers from two to three years, among other changes, was defeated in June by the Senate Education Committee, even after the bill became so watered down that initial backers revoked their support. “The Court has put the responsibility back on local leaders to do what is needed. Changes in law are possible. Our students, our families, our teachers and our collective prosperity cannot wait any longer. California must lead,” Garcia said in a statement. A spokeswoman for LA Unified said the district would have no comment at this time on the Supreme Court decision. A spokesman for the California Charter Schools Association also declined comment. *This article has been updated with reaction from Steve Zimmer, lawyers, teachers unions and more. • Hear audio highlights from the Vergara appeals hearing. • Read previous Vergara coverage from LA School Report, which covered the 2014 trial.